Figuring out the best way to use the space in your facility can be incredibly difficult at times. For many people, being able to visualize the structure is the most important part of the process because they are able to find the different pros and cons of a structure design. However, this can be a difficult step in the process, especially with more intricate structures. Panel Built, Inc. has provided a solution for this problem. We offer a 3D tour for every structure that we provide a quote on. These videos will accurately map out your structure, allowing you to look at the structure from every possible angle. In order to get a general idea of our buildings, below are a few examples of some projects coming to life! This 3D walkthrough was a modular office buildout for our local primary school. 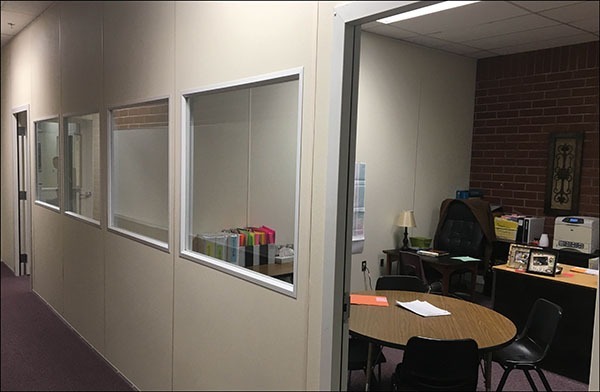 The primary school had an open room that they want to section up into a couple of office spaces and a conference room. Using our proprietary 3D program, we mapped out the potential office space for the school. 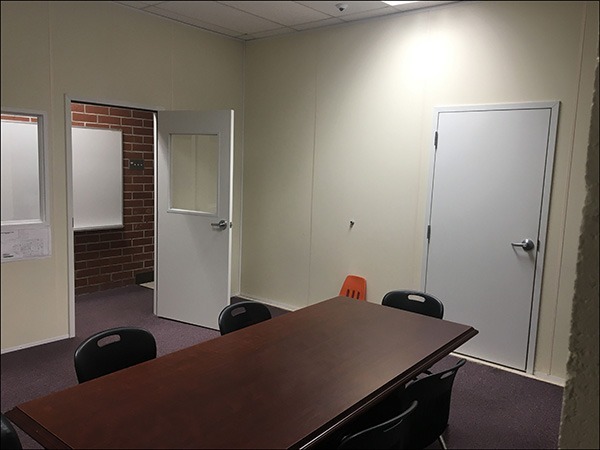 The entire space that you see in the video was designed to simulate the school’s then breakroom area divided up using our modular wall systems. They then used this video to get a general understanding of the layout of the new rooms and what potential benefits and negatives could come from the new walls. In this case, the school system decided to use the exact layout you see in the 3D video. After reviewing the project, they decided that this was the best layout for their new office space and conference room. Below is the final product; you can compare what was delivered to what is seen in the 3D video. Practically every aspect of the project and the school’s space itself are presented in the video, allowing for a great representation of what the final product would be for the customer. Overall, this is a great representation of the usefulness of our 3D modeling videos.The end customer is able to fully visualize how their new space is going to look, and the end product turns out exactly as designed. This 3D mezzanine walkthrough was for a very unique two-story mezzanine that was partially cantilevered. Overall, this project had a lot of specifications and there were pre-existing structures inside the facility that required us to work around them in order for the mezzanine to fit appropriately. 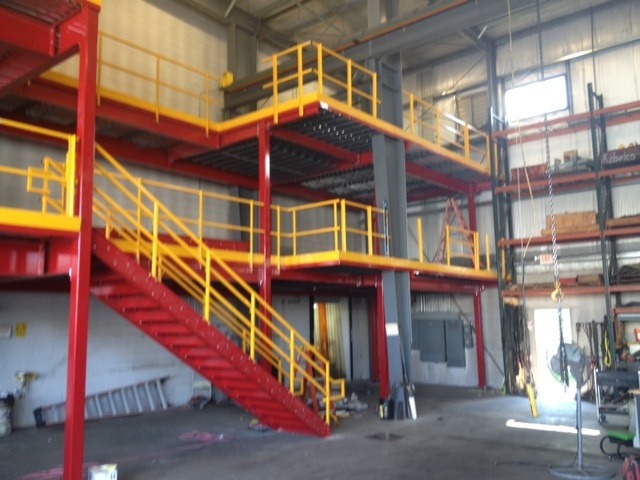 The purpose of this mezzanine was to provide additional storage space above the facility’s manufacturing floor and a two-story mezzanine would allow them to maximize the use of their verticle space. Here is the picutre of the final product. As you can see, the final product had a few revisions from the initial 3D rendering. However, each time we redesign and requote a project, the updated structure will get its own 3D walkthrough as well. Below is the rendering for what would be the final product. The final drawing shows a lot of new features like four slide gates that had been added in the quoting process. Also, the staircase has been moved to the middle of the structure in order to push them away from a pre-existing beam in the facility. Overall, the final product and the final 3D rendering were very similar to one another. 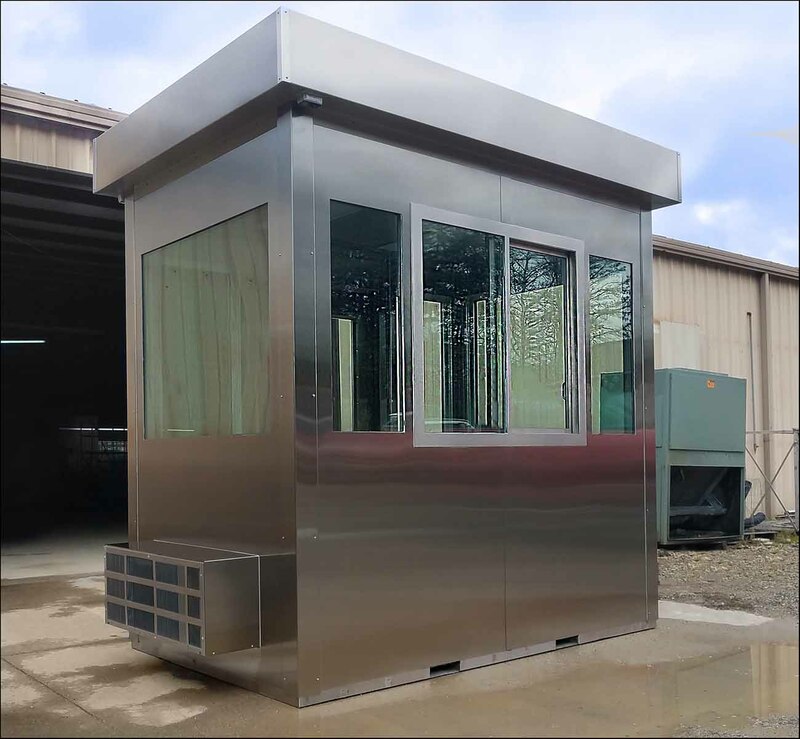 Finally, we can provide you with 3D rendering of a prefabricated guard house. Although, these buildings are typically much smaller than our mezzanines or modular offices, the asthetics of a guard house can be vital to providing customer satisfaction. Especially in highly customized projects, these guard houses can have quite intracate designs that sometimes have not been done before. So, in this scenario, having a 3D rendering of the project can be invaluable for the end customer. In this case, the guard house was to be constructed out of stainless steel. Although the guard house ended up having additional windows in comparison to the one shown in the rendering, the video still provided the customer with a great general idea of how the structure will end up looking and its internal layout. Basic things like, how the guard house work area will be set up, can be figured out through these videos. In other projects, guard houses will have a faux-rock or brick facade and being able to see the facade/ color combo provides a great idea of how the project will eventually end up. Below is how the stainless steel guard house ended up. The 3D rendering shows off how the building really shines. Overall, the 3D videos are provided will all of our quotes for a number of reasons. The most important one is to allow the end customer to visualize what their structure is going to like like at the completion of the project, so that we can make any design changes now to prevent problems for them in the future. Since it can sometimes be tough to visulize a 2D drawing in three deminsions, this tool is oftentimes very helpful in that respect. Also, this can be a neat tool for the dealers of our product to show off to the customers. Very few companies in the modular construction world offer this type of sales tool. When presenting a project idea to a client, these 3D renderings have the ability to provide that little extra needed to get the sale! If you want your own 3D modular construction video, come by and request a quote! All quotes get their own drawing and there are absolutely no fees or cost for them. If you have a project that you have been thinking over for awhile, just give us a call and we can help your project come to life!